Chris Bosh Returns To Toronto Tonight, Will He Be Treated Like LeBron Was In Cleveland? Chris Bosh didn’t stab Toronto fans in the back like LeBron James did to Cleveland, but his departure from the city was still painful.Instead, Bosh made it abundantly clear that he had no desire to continue his career in Toronto and was chomping at the bit to enter free agency. 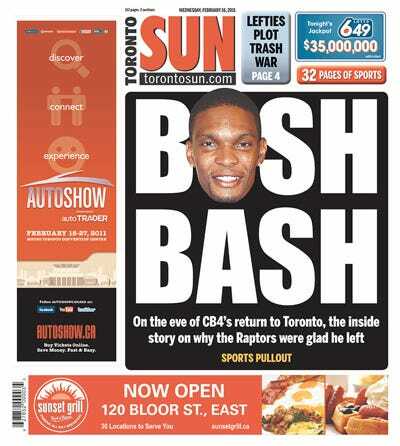 Tonight Raptors fans will have their chance to let Bosh know how they feel about him now. Considering Toronto fans still boo Vince Carter, who hasn’t played their since 2004, Bosh will definitely hear it tonight. Expect a milder version of what went on in Cleveland on December 2nd. Bosh struggled at the beginning of the year with Miami, but has picked up his game in last couple months. He’s averaging 18.4 points per game and 8.1 rebounds. The Raptors are 15-40, while Miami is 40-15.